Maximizing ruminant livestock production is dependent upon, producing and storing quality forage. Once the crop has been harvested, loss of quality may occur simply because steps were not taken to correctly manage the forage during filling and storage. This fact sheet reviews bagged silage recommendations that help to maintain high quality forage. To aid in forage removal and to minimize losses during feed out, place bags on an all-weather base such as macadam, asphalt or concrete. A correctly designed paved site provides an additional benefit in that it can be converted to bunker storage at some point in the future by adding walls. A firm, well drained site is essential for year-round access. Avoid placing bags in locations with drainage issues. Orient bags north-south to promote melting of snow. Leachate and contaminated runoff can pollute surface and ground water. A Wisconsin state standard is currently being developed which specifies how leachate and runoff from feed storage areas must be managed. Locate bags away from woods and tree fence lines. Mow weeds around the storage pad and provide an un-vegetated, 3-ft perimeter around the storage pad to discourage rodents from approaching bags. Keeping bags away from other feed sources may also reduce damage caused by the occasional stray livestock animal. Clean up spilled feed to avoid attracting rodents. Consider fencing the storage pad area to exclude domestic animals. Keep children from playing on or around bags. Take care when operating equipment near bags. Take measures to protect bags from punctures. 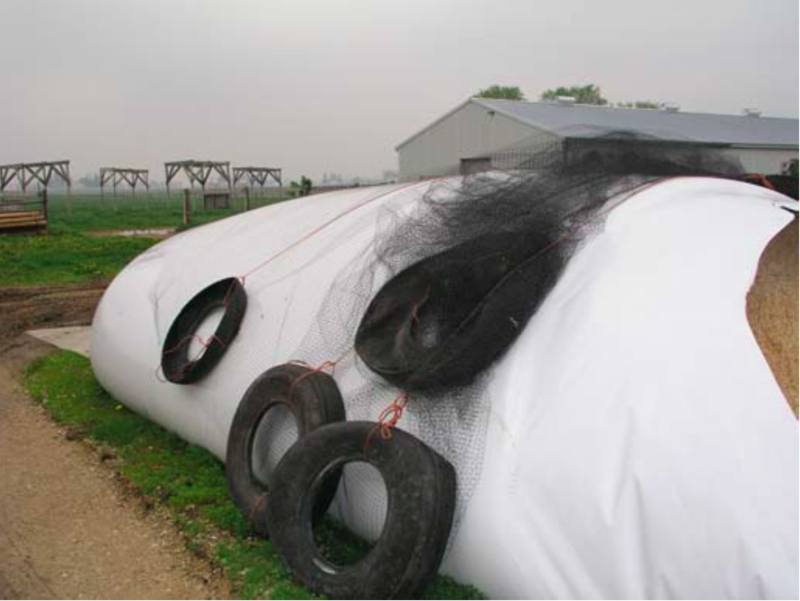 Silo bags are punctured by a variety of causes including, but not limited to equipment, people, animals (domestic, wild), hail, etc.It is important to closely inspect the silage bags for holes regularly. Punctured bags allow air to enter, which can cause significant feed deterioration. Any holes should immediately be sealed with tape to prevent oxygen from entering the silage mass. Most manufacturers offer special patch tapes that adhere tightly to plastic silo bgs and are weather and light resistant. Commonly available duct or masking tapes are not generally suitable for this purpose and will not provide a long-term seal. Forage should be harvested at the correct degree of maturity to assure desired feed quality and proper sugar content for good fermentation. Also, to reduce the risk of weather related losses, hay crops should be chopped and stored within three days of cutting. Optimal relative forage quality (RFQ) is achieved when alfalfa is cut at or near 170 RFQ based on scissor clip or PEAQ measurements. Chop alfalfa at 3/8-inch theoretical length of cut (TLC) with 15-20% of the particles exceeding 1.5 inches long. For corn silage the recommended TLC is 3/8 inch without a processor or 1/2 to 3/4 inch with a processor. The preferred corn silage moisture range for bagged silage is 65-70%. Begin sampling whole plant moisture when the corn kernel contains about 80% milk. Use a 0.5% per day predicted dry down rate from the sample date until 65-70% whole plant moisture is reached. Seepage of forage juice can occur if forage is harvested at moisture contents above 70%. This juice carries away a high concentration of soluble nutrients, representing a significant loss of valuable feed. For hay silage the preferred moisture is 60-65%. Clostridial fermentation is more likely in hay silage if the forage moisture is greater than 65%. Clostridial fermentation produces silage containing butyric acid and is less stable when exposed to oxygen. What are the recommendations for filling silage bags? Rapid silo filling (within 3 days) increases the uniformity of forage moisture and quality in the silo, and reduces exposure of the forage to precipitation and air during filling. Rapid silo filling is accomplished by having sufficient harvest, transport and silo filling equipment capacity and adequate labor to operate the equipment. Bottlenecks to rapid filling should be identified and eliminated. Since bag filling machines move as the bag is being filled, forage spilled can be lost if allowed to remain on the ground. Clean up feed as it spills or directly after each wagon or truck load is emptied. Once filled, seal the bag tightly. Several methods can be used to seal bags. One common method is to stretch the remaining plastic out, then place a board on the plastic and wrap it around the board back toward the bag much like re- sealing a bag of potato chips. Hold the end of the plastic in place with some form of weight (sand, discarded silage, etc.) or simply nail another board to the one used to wrap the end of the plastic bag. What is the proper adjustment for bagging machines? The bagging machine should be adjusted to form a tightly packed forage. 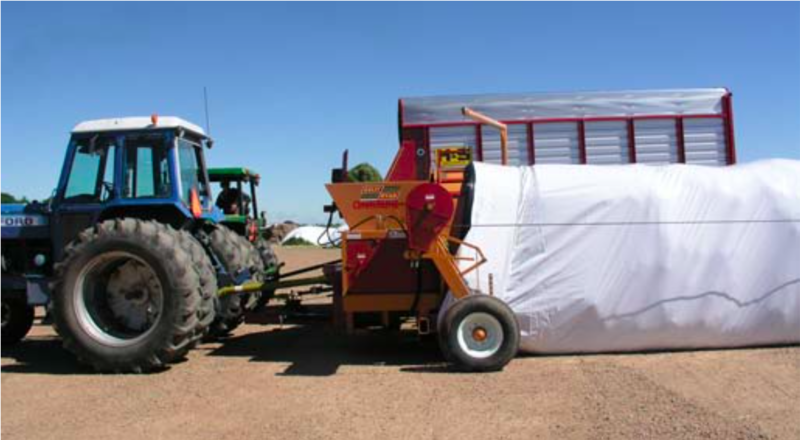 The higher the density of forage in a silo bag, the lower the amount of air infiltration as the bag is opened or if the bag is punctured. Most silo bag manufacturers provide recommendations on filling bags. Some provide stretch lines on the plastic bag as gauges to avoid over-filling. Measuring the distance between these lines gives an indication of when the bag is full or over-filled. The early stages of fermentation can result in excess gas build up within the bag. Plan to vent this gas so it doesn’t cause bag splitting. Bag suppliers can provide a vent for this purpose. Follow the manufacturer’s recommendations for adding vents to the bag. Remember that these gasses are poisonous. Learn to adjust the packing machine’s braking pressure for varying moisture levels. If moisture levels are high, reduce the packing pressure to avoid creating mushy, oozing silage. If moisture levels are excessive (over 70%) consider stopping harvesting until the forage is drier. Wet silage is a poorer product and has a greater chance of freezing. If moisture levels are low, it will be difficult to distribute the silage throughout the bag. In this case, increasing the packing pressure can help. Excessive braking pressure causes over-filling that increases wear on the machine and tension on the plastic silage bag. On the other hand, if too little pressure is applied, the bag will not fill to capacity. This increases both plastic costs per ton of silage and the probability that more air will be entrapped in the silage mass. Avoid these air pockets that interfere with proper fermentation. Air pockets can also be minimized by chopping at a shorter theoretical length of cut, 15% or less of the hay particles exceeding 1.5 inches. Unfortunately, reducing fiber length also reduces available effective fiber for the animal. As silage dry matter increased, both density (lbs. dry matter/ft3) and porosity increased. In other words, the drier the silage, the more dry matter was packed into a given volume, but the more susceptible it was to air movement and dry matter losses. Densities tended to decrease as particle size increased. Densities varied with the person operating the machine, indicating that correct operation of the bagger is critical to getting a smooth bag of high density. 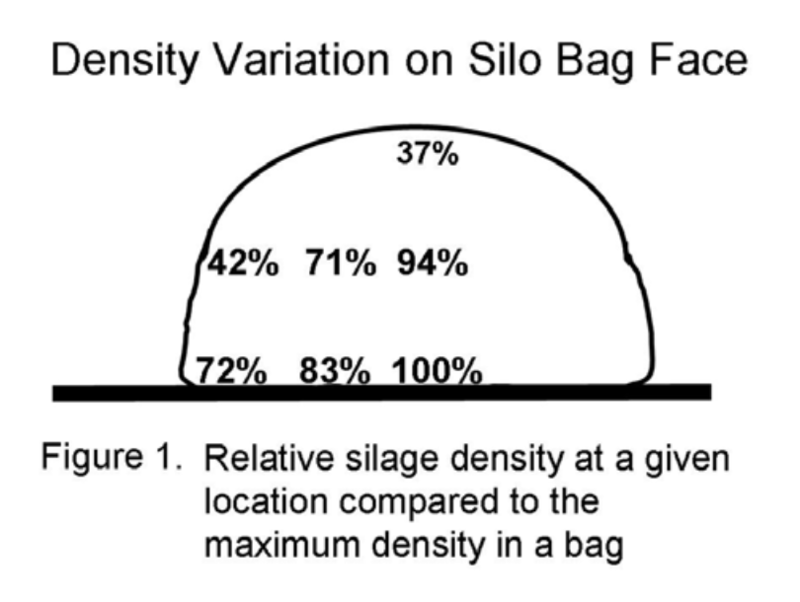 Densities varied dramatically across the face of the silo bag (figure 1). The density of silage around the top outside half of the bag was only about 40 percent of the densest region on the bottom center. This suggests that any holes occurring in the top half of the bag would allow for the free flow of oxygen causing high amounts of spoilage throughout the top part of the bag. 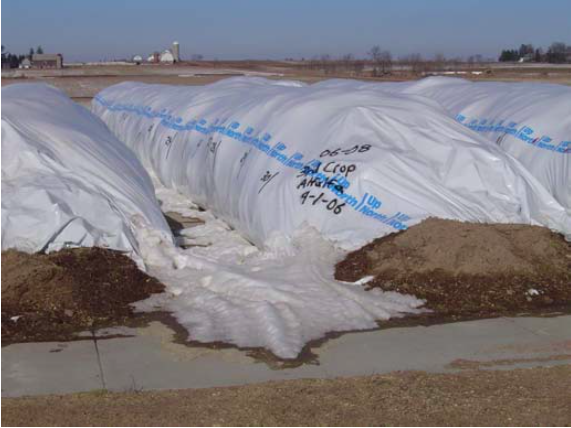 Compared to bunker silos, researchers proposed higher feed removal rates are needed to keep bagged silage from spoiling. A recommended minimum feed out rate of 12 inches per day was suggested. Total dry matter losses (gaseous, seepage, and spoilage) ranged from 0.3 to 39.9 percent. Average dry matter loss across all bags was 14.6 percent (similar to a well managed bunker). If the worst six bags were eliminated (47 total bags in study), the average loss dropped to 11.6 percent (similar to a well managed bunker). If the worst six bags were eliminated (47 total bags in study), the average loss dropped to 11.6 percent. Of the six with the worst spoilage, one had bird damage (30.6% loss) and the plastic burst on another bag early in fermentation (39.9% loss). Both situations were repaired, but forage quality was still affected. High losses were generally associated with either plastic damage or feeding out drier silages under warm conditions. Losses tended to be higher when silage was either too wet (gaseous/seepage losses) or too dry (spoilage). See references for further details on this topic. What about the fermentation process and the use of inoculants? The fermentation phase lasts 14-21 days. During this time, the forage varies in quality from day-to-day. Since cows perform best when presented uniform quality forage, avoid feeding silage during the fermentation period. Silage fermentation naturally occurs under anaerobic conditions. An effective fermentation process is based upon a variety of factors including the types and numbers of bacteria found on the forage. Inoculants may improve this fermentation process, but before selecting inoculants first assure silage management is correct, avoiding problems such as ensiling overly dry crops, poor packing density or low feed out rates. What is the recommended feed out rate for silage bags? The removal rate (inches removed from the silage face per day) influences loss during the feed out period. Maintaining adequate removal rates are especially critical with hay crop silages, high moisture corn and drier silages. When designing storage, a good recommendation is to plan to remove at least twice the minimum recommended removal rate. Muck and Holmes (2006) recommended a minimum silo bag removal rate of 12 inches per day. Only the amount of silage that will be fed in a short period should be removed or uncovered at one time. At no time should more than three days worth of silage be exposed. With bags, it is always important to close the bag off after each feeding. Open bags cause billowing plastic that pumps air over the silage, increasing losses. Some producers have used a weighted chain, rope, or cable draped over the plastic near the feed out to limit air movement between the bag plastic and the silage. Many methods of silage removal are used on farms. Perhaps the most common method is the bucket loader. The preferred method of silage removal with a bucket is to scrape the silage from the top, and allow it to fall to the floor. Another method is to undercut the silage several inches up from the floor and then slice the balance of the face into the cavity. Whatever removal practice is used, the silage face should remain tight and smooth. Avoid methods that result in dislodging the face. Creating gouges, cracks and potholes result in air penetration deep into the silage mass and lead to increased spoilage. For more information on feed out losses see Clark (2002). Unlike other storage formats, bags or parts of bags can be labeled to show the location of specific feed inventories. Differences between fields or loads (moisture content, crop type etc.) can be marked on the bag. The quality of specific forages can then be matched closely with the nutrient demands of specific classes of livestock. Bags need to be disposed of properly. Plastic waste handling and disposal is a disadvantage of silo bags. Presently, landfilling is the recommended practice to dispose of plastic waste. Alternatives to landfill disposal are being explored. Hopefully, sometime in the near future, recyclers will be accepting this plastic waste and using it as a fuel or making it into other plastic products. Bickert, et al. 2000. Dairy Freestall Housing and Equipment (MWPS-7). Midwest Plan Service. pp.119- 120. Muck, R. and B. Holmes. 2006. Bag Silo Densities and Losses. Transactions of the ASABE. Vol 49(5): pp. 1277-1284.